Wahoo! 2010 is definitely turning into the "Year of Knitting". I've just finished two more projects - that makes a total of 4 projects completed in January! 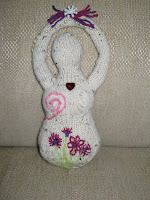 I made the Knitted Goddess doll as part of a Monthly Adventures swap. She was very easy and a lot of fun to make. I used the "Knitted Goddess Pattern" by Michelle Simkins and a partial skein of yarn that was left over from another project. I believe I used only about 50 yards of yarn to knit the goddess. In completing this project, I did discover that I definitely need some lessons on embroidery! Even the simplest of stitches was giving me fits, so I just had to "wing it". I think she came out OK. She's a bit on the corpulent side, but that makes her more realistic, right? I'm calling her, "Hope of Spring". I also finished a very soft and silky cowl for another Monthly Adventures swap. 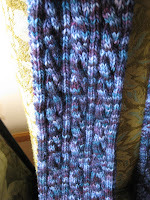 The pattern is called the "Wavy Feathers Wimple" by Caryll McConnell. 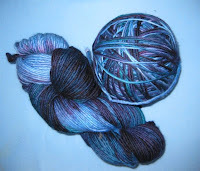 I decided use Jagger Spun Zephyr - 50% Merino and 50% Silk lace weight - it's a very soft and lustrous yarn. 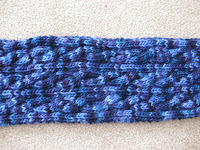 My friend Carola had made a lovely cowl using this pattern and some handspun. It looked so beautiful that I was inspired to make one as well. 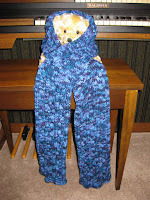 The pattern is great and offers instructions for two sizes. 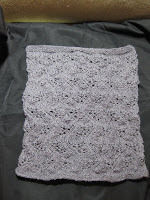 Since I was using lace weight, I had to cast on 143 stitches, so my cowl took a bit longer to make than Carola's version. 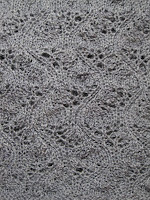 The lace pattern is quite pretty and was not difficult at all. 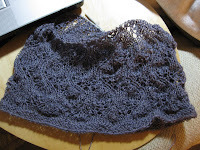 I'd definitely recommend this pattern to anyone that's wanting to get into lace knitting, but not quite ready to commit to a shawl or stole sized project...as long as they're comfortable knitting in the round. I've also completed the first sleeve of my "Weekend Retreat Cardi" - wahoo! One sleeve and the button band to go and she'll be finished. Of course, I've started another pair of socks. This time, the socks will be a deep, rich burgundy and black out of Universal's "Ditto" sock yarn. 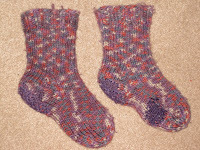 I'll be using my favorite "go to sock pattern" - "Hellen's Favorite Socks" from Fiber Trends and the 2x2 rib. January has definitely been a great month for knitting progress! I am so glad that I got up early on Tuesday! I was greated by the most awesome sunrise. Isn't it gorgeous? 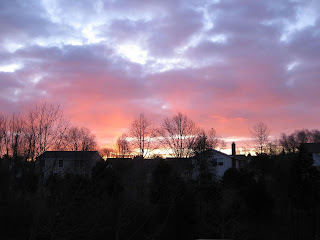 Many folks around here commented on how beautiful the sky was. 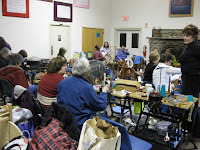 On Tuesday evening, I met with some friends to knit, chat and ogle gorgeous fibers. 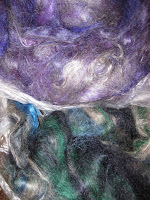 I purchased some awesome mohair from my friend, Colleen, of Giant Cricket Farm. She'd just received her wool back from the processor - Bailey's Fjord. It's awesome! Ack....I can't remember right now which animals the fibers came from, but it's all from named and loved animals. 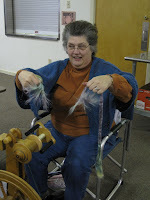 Sandy, the resident "FiberGuardian" never strays far from new roving - it's full of such interesting smells! On the top right is the purple blend - it makes a lovely rich purple yarn....I can't wait. 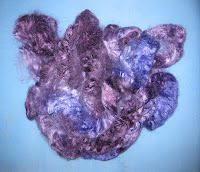 The roving on the bottom right makes a rich teal when spun into yarn. Both are absolutely gorgeous - and the luster! Wow! 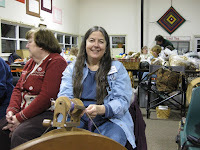 Last weekend, I attended my third retreat with the Lancaster Spinner's and Weaver's Guild. 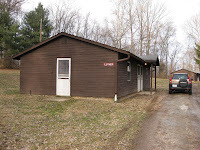 This year, it was held at Camp Donegal - the perfect venue for the retreat. In the great hall, we had a huge fireplace. 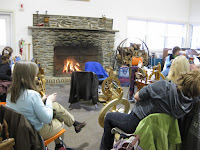 We scattered ourselves around its stoney warmth with all our spinning wheels, CSMs, and other fiber crafting tools. The dining hall was on the other side of the room, so we didn't have to go far at meal times. It was afabulous set up! The food was great too! The kitchen staff prepared fabulous meals from scratch with lots of variety...and always, a tasty home made soup accompanied the delicious lunches. There were tasty homemade desserts as well - several varieties of awesome cookies, red velvet cake, and warm from the oven brownies - awesome!!! Our sleeping quarters were in rather rustic cabins. They were clean and toasty warm - that's the most important thing. The only challenge foir me was getting used to the single mattress on top of a plywood frame. It was pretty comfortable though. 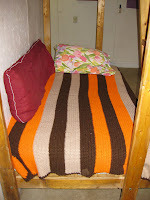 I brought lots of pillows and blankets with me, and for a bed spread, I had a hand crocheted afghan that my DH's grandmother made - I thought that was appropriate since I was at a fiber retreat. 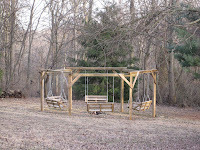 There were a number of hiking trails on the property and several lovely sets of outdoor swings to rest on. It was a bit too cold to enjoy knitting outside, but in the spring or fall, the outdoor swings are the perfect venue for a lazy knitting afternoon while soaking up some Vitamin D! 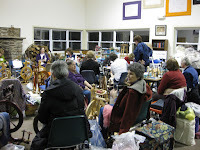 Several of the attendees had some fabulous yarns and fibers to sell. Even though I'm on a "yarn diet", I "had" to buy some of the goodies (I do make provisions for festivals and retreats in my "diet plan" - LOL!) I purchased lots of alpaca from both Pam (AlpacasAndBeyond) and Cyndy. Then, there was the positively divine bunny/alpaca fiber that Kathy (AlmostARanchAlpacas) sells. Simply awesome, incredibly soft fibers. I also purchased a used spool rack for my loom from Faye who was "destashing" - that should come in very handy once I have to warp it! 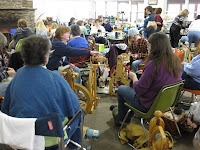 We spent the entire weekend spinning, weaving, knitting, crocheting, rug hooking....you name it, we did it! 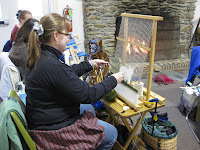 Cindy, a very talented weaver, has just warped her loom to start a new tapestry. She's recently moved, and there are bears near her new home, so she's designed a tapestry focusing on her "new neighbors"...the black bears. Tina discovered the "joy" of silky fibers and static electricity! It was a bit of a challenge to "rein it in", but she "tamed the wild fibers". Of course, I had no doubt that she would. After all, she organizes this entire retreat - and does and absolutely fabulous job every year! 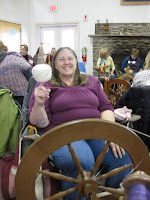 Cyndy has finally mastered the spinning wheel! Wahoo! Her first successful skein was completed 2 years ago....and last year, she didn't get much spinning done and spent most of her time "wrestling with her wheel". This year, she mastered it...with some lovely Merino no less! She's now decided she "must have" a new wheel. The Ashford traditional was put up for sale and sold in two days...and she's procured a "Lady Bug". Congratulations Cyndy!!! My knitting focused on the cowl for my Monthly Adventures swap. The yarn is Jagger Spun Zephyr 50% Merino/50% Silk lace weight yarn. 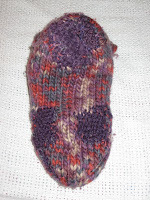 The pattern is the "Wavy Feathers Wimple". It's a very easy lace pattern done in the round. 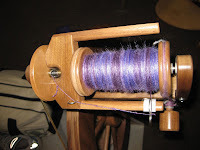 My spinning time was totally dedicated to finishing 2 ounces of some gorgeous purple silk that I bought from the Brosana's at the Shenandoah Valley Fiber Festival in 2008. I have the other 2 ounce bag to spin before I can ply, but I'm getting there! Silk takes soooo long to spin as you can spin it quite thin. The company and the food were wonderful! We all hated for the weekend to end, but like all good things, it must end. I can't wait until next year! Mom LOVES the bedsocks I've made for her...she has 4 pairs. However, her absolute favorites are the first pair I made for her. They've been darned in the about 1 1/2 years ago to repair HUGE holes - and we're talking holes in excess of 2 inches in diameter! It seems that her well-worn, well-loved socks again need some repair. So, tonight, I spent my evening darning her socks...again. I've photographed both sides of both socks so you can see the general condition of the socks themselves (VERY well-worn! ), as well as the repairs. Once again, I used my improvised darning egg of choice - a metal soup ladle. It's absolutely perfect for darning these socks - stick it up the leg of the sock, steady it between your legs, and voila! I was all set to go! The sock on the left was the "most needy". It required two separate "repairs" this evening. Poor thing! I thought a closeup of the sole would be appropriate. Geez...I can't believe how much use these socks get! Oh...tonight, I dropped in on a knitting group that meets at the Peru Library. They're a very warm and welcoming group and I felt instantly at home. 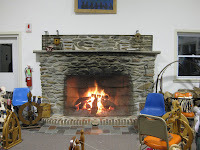 The group tonight was small - probably because of the weather - I think some folks decided to stay home and stay warm! If it's not snowing, it's blowing...with zero or sub-zero temperatures! None the less, I had a fabulous time chatting and knitting. I definitely intend to drop in on them the next time I'm in town! I'm even going to participate in one of their projects. It's the 100th anniversary of the Peru Library...and to celebrate, they're covering a chair in knitting and/or wrapping it in yarn and then adorning it with 100 felted flowers. Mike, one of their members and a key organizer, showed me a picture of the chair they're modeling theirs after. I think it's a fabulous idea - and very unique! 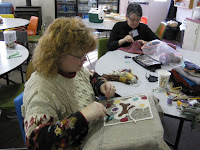 So, I'll be knitting and felting at least 2 flowers to be incorporated into the "chair-art" project. The completed chair will be on display in the library as part of the 100 year celebration. While chatting with the members of their knitting group, I got the "scoop" on where all the local yarn shops are. Unfortunately, it's just as I suspected based on my internet search - most are an hour or more away. 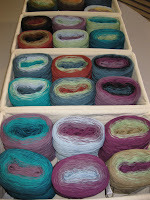 BUT...there are a few nearby quilt shops that also carry yarn - and not just the acrylic yarns either - so there is hope! I've been very disappointed with the offerings at both Walmart and Hobby Lobby here. Both seem to have reduced their supplies of both wool and wool blend yarn significantly and are displaying even more acrylic than last year. Walmart seems to have significantly reduced the size of its yarn section! This is all very sad because these are the closest sources for your supplies and yarn...and even that seems to be dwindling! The scarf is now 3/4 complete! I did manage to take a photo at about the "one third" mark. The patterning in the yarn obscures the cabling, so it doesn't show very well. The closeup shows the cabling a bit better, but it's still not very distinct. Oh, well....it's the color my sister wanted, so hopefully she'll be happy with this! (I know she loved both the look and the feel of Mom's, but my mom's was pretty much a kettle dyed solid blue which really made the cables pop). If I can manage to work on it this evening, I just might have my second finished object for the year before the end of the 11th day! First Finished Object of 2010! 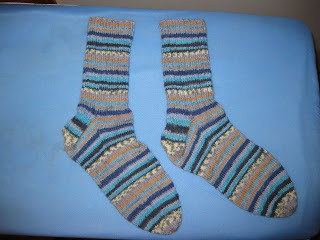 I've completed my first finished project this year - my "On-line Socks". 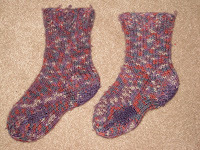 These poor socks have languished on the needles since October 2009, but with a push the last week of 2009 and the first week of 2010, I managed to get them finished. They even have a "special signature" - LOL! 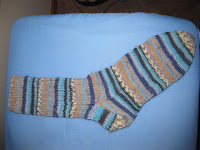 I totally forgot to do 7 rows of 1x1 rib at the top of the second sock, so the top of each is just a wee bit different. As I wear these, I'll critique the "feel on the leg" to see which I prefer. I always knit a 1x1 rib at the top of my 3x1 rib socks....mainly to help hold them up. I'm interested to see if there's any difference in how the socks stay put or in how they feel on the leg. I actually like the look of the sock better without the 1x1 rib, so I'm hoping to find that I really don't need to add a 1x1 rib after all! 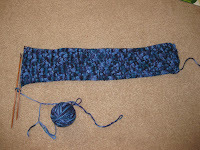 ...Off to continue working on my sister's Irish Hiking Scarf - I'm about 1/4 of the way done! Well, I managed to NOT do any spinning in celebration of St. Distaff's Day. 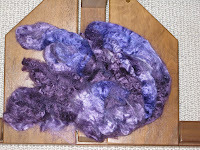 However, I did fondle my silk roving - I just love it! All purples and blues! Did anyone do anything special to celebrate? 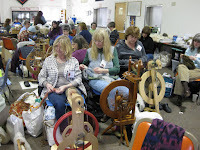 I know lots of groups are planning spin-ins this coming weekend....perhaps I can work in some spinning then. Instead, I worked on my sister's Irish Hiking Scarf instead. My goal is to get it finished by the end of the coming weekend, then blocked, and hopefully shipped out to her before the end of the week. I'm currently just over 1/4 of the way done. Wish me luck! Though it's been a rather busy and hectic time of the year, I've managed to find a bit of time to knit and to spin. First off, the knitting. My little sister has seen my mom's Malabrigo scarf and absolutely LOVES it - she fondles it constantly. She love the yarn and loves the pattern. It's the "Irish Hiking Scarf" - definitely a gorgeous scarf and a fun and easy knit. I tried to talk her into the "Palindrome Scarf", but she insisted on EXACTLY the same style as mom's. She was also quite jealous when she discovered that my daughter was wearing a scarf I'd made....and that she had another one as well. 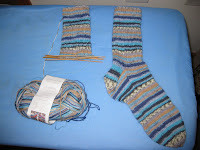 I've continued on with my "On-line" socks and have one sock fully completed. It was finished in the car on the way to my mom's Dr. appointment. Luckily, my sister was still here, so she drove (so I'd know the way there for later appointments) and I took full advantage of the knitting time. I then promptly cast on for the second sock and got quite a bit done. I expect that I'll have a full pair within the next few days....and then it will be time to cast on another pair. Thankfully, I've brought numerous skeins from my "meager" (LOL!!!) stash! 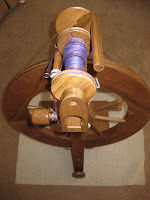 I've even managed to work in some spinning. My sister seemed very intrigued by the whole process and wondered how I learned to spin...and what made me try it. She used to have a needlework and quilt shop...and she was an avid knitter, though I don't think she's done much knitting at all in the past several years. 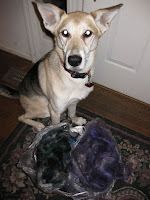 I brought several roving samples with me - some Corriedale, some Merino, and some silk. I asked mom to select what I should spin, and she picked the silk. Both mom and my sister were surprised at how thin you can spin silk. It's a lovely color way - I'm thinking lace shawl/shawlette when I'm done spinning. I'll have to see how much yarn it yields, and then determine what I can "mix with it" if there's not quite enough. Pssst! St. Distaff Day is January 6th! How are you planning to celebrate?? ?